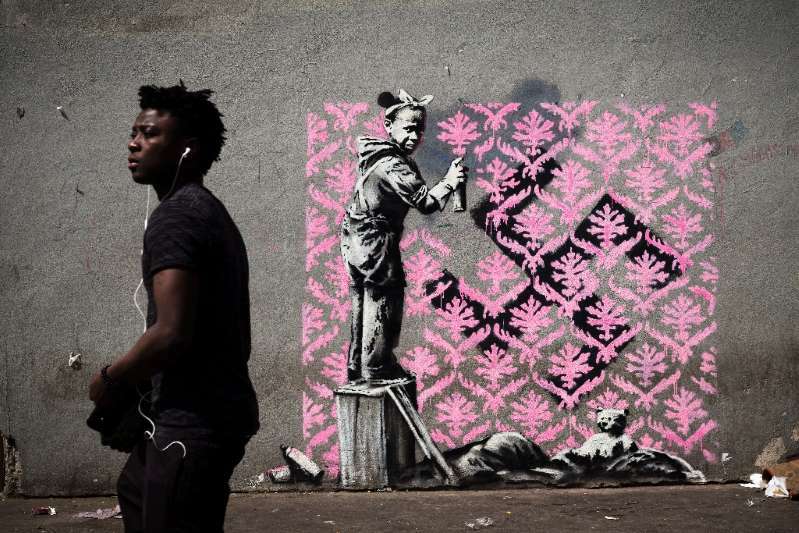 Street artist Banksy has confirmed that he "blitzed" Paris with a dozen murals as a tribute to the May 1968 uprising, taking aim at the French government's hard line on migrants in some of them. Stencilled images in the style of the mysterious British graffiti star began appearing on walls across the French capital last week. All were unsigned, leaving a lingering doubt that they might have been by a imitator. But late Monday the Bristol-based artist posted his latest two Paris murals on Instagram -- neither of which had yet been found by his fans. "Fifty years since the uprising in Paris 1968. The birthplace of modern stencil art," he quipped under a self-portrait as a masked rat carrying a utility knife that he uses to cut out his stencils. Cheekily he sprayed it on the back of a road sign outside the Pompidou centre modern art gallery, which houses Europe's biggest collection of contemporary art. Paris mayor Anne Hidalgo, who set up the centre, was quick to hail the mural. "Sometimes an image is worth a thousand words. Humanity and pragmatism rather than populism," she tweeted in a dig at Macron, who had argued the shelter was making Paris a magnet for migrants. 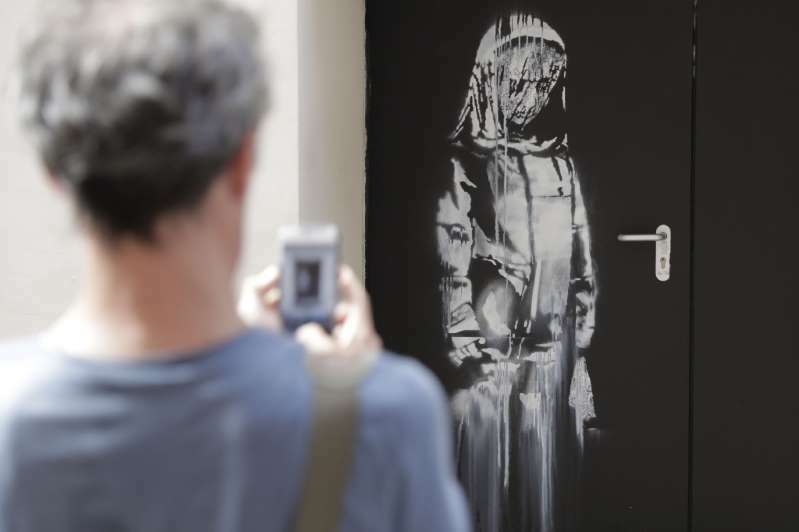 In his first clandestine "blitz" of the French capital, Banksy also created a image of girl huddled in mourning in a fire exit next to the Bataclan concert hall, where 90 people were massacred by jihadist gunmen in November 2015. His final stencil -- which he posted to his Instagram account on Monday evening -- shows a genteel old rat couple out for a walk along the River Seine near the Eiffel Tower. 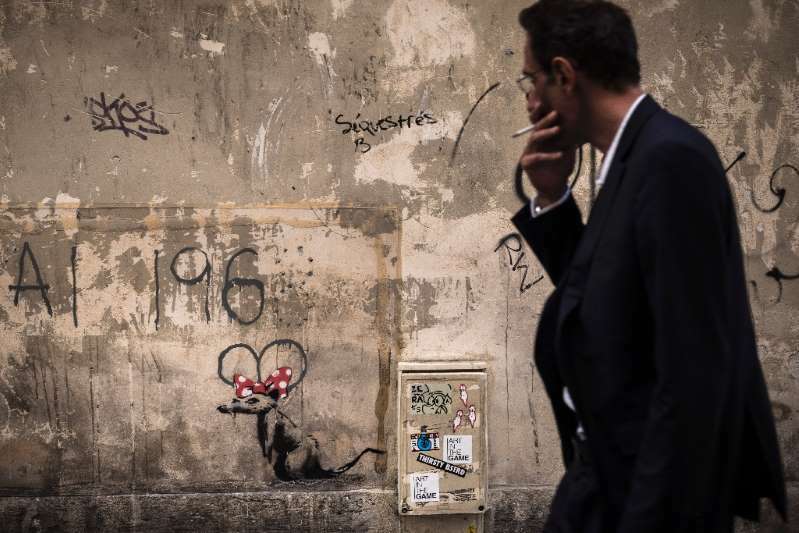 Banksy's work has sold for more than $1 million at auction, and fans have already covered some of the new Paris works with Plexiglass to protect them. However, his mural of the migrant girl was defaced with blue spray paint late on Sunday after news of its discovery spread on social media. Many believe Banksy to be musician Robert Del Naja, a 52-year-old member of the Bristol-based trip hop trio Massive Attack. The band are playing the French city of Lyon on Sunday.